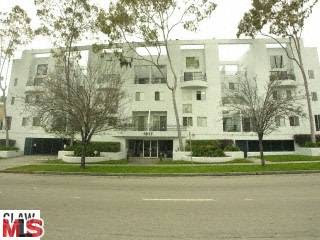 A new REO, Bank Owned, condo hit the market today on Beverly Glen in Westwood. 1617 S. Beverly Glen #105, LA CA 90024 was previously listed as a short sale, starting with an asking price of $650k and ending with an asking price of $450,000 before expiring. The new REO asking price is $435,000 and should not last that long at this price. The 2+2 Townhome is aprox 1,409 sq ft of living space. This particular unit is front facing and features high ceilings in the living room with a loft overlooking the living area. Even though the unit is on the first floor, it's really 1 floor up from the ground. Also in typical REO fashion, this unit is slightly beat up and will need some clean up/renovations. The 24 unit, contemporary style building was built in 1988. Homeowners' dues are $385 a month and include earthquake insurance. According to the previous MLS records, the owner purchased the unit in 2003 for $450,000. One last thing I will mention is the 2nd bedroom in this unit is very tiny. I would really consider this more of a 1 bedroom with a small office.